Omeka is a free, flexible, and open source web-publishing platform for the display of library, museum, archives, and scholarly collections and exhibitions. Its Ã¢Â€Âœfive-minute setupÃ¢Â€Â makes launching an online exhibition as easy as launching a blog. Omeka is designed with non-IT specialists in mind, allowing users to focus on content and interpretation rather than programming. It brings Web 2.0 technologies and approaches to academic and cultural websites to foster user interaction and participation. It makes top-shelf design easy with a simple and flexible templating system. Its robust open-source developer and user communities underwrite OmekaÃ¢Â€Â™s stability and sustainability. Standards-based metadata and web design - Every item and file contains fields for Unqualified Dublin Core elements. Dublin Core is an internationally-recognized and widely-adopted schema. Omeka comes packaged with design themes that follow best practices in accessible web design and are section 508 compliant. Customizable Web Design - OmekaÃ¢Â€Â™s pre-packaged design themes can be quickly modified. 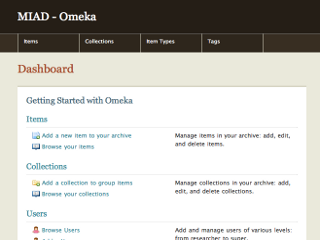 Custom themes can be built using OmekaÃ¢Â€Â™s flexible API and documentation. Interoperable - Unqualified Dublin Core data, combined with Omeka-generated feeds and OAI-PMH harvestable data, give Omeka sites the ability to share data among different systems and with other Omeka sites. Data Migration - Populate an Omeka site by adding items individually or batch add using data migration tools, such as the OAI-PMH harvester and CSV importer plugins. Re-Purposing Content - Enter or import item metadata once, and use items and metadata in multiple instances across website. Items may appear in multiple exhibits. Exhibit building - Create rich, interpretive exhibits that combine items in your Omeka site with narrative text. An item may be used in multiple exhibits. Create and organize items into collections. Tag items and exhibits with keywords. Items and exhibits may contain an infinite number of tags. Publish non-Roman characters. Omeka supports Unicode (UTF-8) that allows users to build sites with non-Roman characters, including scientific symbols, that display properly in web browsers. Plot individual items on a Google map with the Geolocation plugin. Syndicate Omeka site content with RSS and Atom feeds. Reporting - Create customized reports with a simple HTML export, or PDF export that prints QR Codes. Extend core functionality through plugins - OmekaÃ¢Â€Â™s plugin API makes development of plugins to suit the needs of your project quick and easy.